Along with being our company’s mission statement, this phrase is also one that the Johnson family lives by. Lee Johnson, the dealerships second generation owner, believed in these words so much that he had them posted in each office as well as various places around our store. Our priority and what we believe differentiates us from our competition is our focus on customer service. Each of our service advisors and sales personal are individually responsible for ensuring that each customer they come in contact with is completely satisfied. We strongly believe in the repeat and referral business and to be successful we must view people as long term clients rather than quick sales. While we believe returning customers are our lifeblood, it is our long time employees that make the customers always feel at home and welcome. Through over 80 years of ownership our philosophy has always been simple, treat our employees well and in turn they will provide excellent service to our valuable customers. 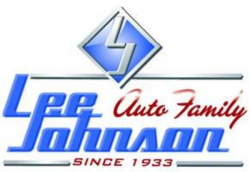 Lee Johnson Chevrolet has a long and active history of community service, including youth sports sponsorship, driver education, Equifriends and many more. Here at Lee Johnson Chevrolet / Mazda there are over 30 employees with at least 10 years of service, many with over 20 years and even some with 40 years!